Posted by Cee Tee Jackson on September 2, 2016 in Uncategorized and tagged Amazon, Kindle, Man, Mars, new release, TWMOM, worst. I shall re-press this for you tomorrow morning! Anyone who loves dogs and writes is cool in my book! Love your marketing angle, by the way! Thanks Pamela – but I should say that this is not my book It’s one that I followed the development of over the past year or so. It’s by a couple of writers who frequent the same dark, shady and slightly unhinged writing groups as me. 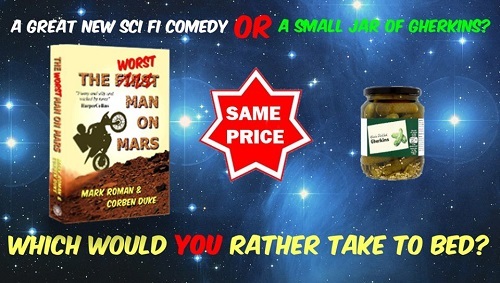 It’s excellently funny – like a combo of Red Dwarf and the Hitchhiker’s Guide to the Galaxy but with added deadpan, Yorkshire humour.